A Washington in GTA Vice City. The Washington is a 4-door sedan found in Grand Theft Auto: Vice City, Grand Theft Auto: San Andreas, Grand Theft Auto: Vice City Stories, Grand Theft Auto IV, and Grand Theft Auto V. It can be found fairly widely throughout cities and in mostly the residential area in GTA Vice City and GTA San Andreas, and is available in many colors throughout the games except gray and white, which are reserved for the FBI Washington in GTA Vice City and GTA Vice City Stories, respectively. "Rich man's sedan, import from UK." 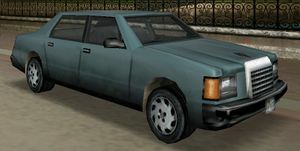 Depictions of the Washington prior to GTA IV bear a similarity to a 1984-1987 Lincoln Continental, with the rear more alike a Lincoln Mark VII. The Washington features a generally boxy but then contemporary design resulting in the car being one of the newest cars at the time of GTA Vice City's and GTA Vice City Stories' 1980s settings. The colors of the car are varied, with up to eight sprayable colors. For GTA San Andreas, the car remains largely similar, with the exception of wider headlight clusters, a modified front grille and rear light clusters that light up as a whole at night. While similar to the GTA Vice City rendition, the GTA Vice City Stories Washington sports additional side trims derived from the FBI Washington, implying the FBI Washington's vehicle model was used in place of GTA Vice City's original Washington model. In GTA IV, the Albany Washington is based on the 2003-2011 Lincoln Town Car while the headlights and grille have a slight resemblance to a 2008-2009 Ford Taurus. The body style is based off of the Ford "Panther" platform, which the Lincoln Town Car, Ford Crown Victoria, and Mercury Grand Marquis were built on. It features "Executive" badging, much like some Town Cars. The rear portion of the car mainly represents the 1998-2011 Ford Crown Victoria, evidenced by the shape of the trunk lid with the taillights being a slight hint to the car as well. The rim design is taken from those of the 1998-2002 Crown Victoria LX. The GTA V rendition of the Washington is identical in design to the GTA IV rendition. A Washington in GTA IV (Rear quarter view). A Washington in the second GTA V trailer. A Washington in GTA V (Rear quarter view). Pre-GTA IV Washingtons are generally regarded as having only moderate performance, being RWD, it is largely attributed to its bulky design. Its longer wheelbase and weight, often results in understeer and poor cornering, while its size may also be a factor in its moderate acceleration, and its top speed is also estimated to be moderate. Nevertheless, its superior size and weight allows the Washington to ram aside other sedans more easily. The Washington in GTA IV is powered by a V8, coupled to a five-speed gearbox in a RWD layout. Acceleration is good, but due to the bulk of the vehicle it leaves much to be desired. Top speed is also good, but again due to the Washingtons weight, is limited: 135 km/h (84 mph). Braking is very good, and ABS is standard across the line up. The suspension is very soft, designed to flatten out bumps in a road; not high speed cornering, leaving the Washington fishtailing and spinning out of control when cornering at speed. Accident deformation is superb, making the Washington ideal for ramming vehicles. The engine build quality is also above average, and will sustain multiple impacts before failing. The FBI Washington is a specialized version of this vehicle (only appearing in GTA Vice City and GTA Vice City Stories), and is the only version of the Washington in GTA Vice City that sports a dark gray paint job. Its acceleration is quite impressive, which becomes useful for catching up to distant criminals when on a Vigilante mission. In GTA Vice City Stories the car is much more harder to get however because stealing it from the FBI is more challenging rather then finding one. Also the FBI Washington can be the same color as a regular one as there are white regular Washingtons. Similarly, two uniquely black Washingtons may be seen driven by the French in GTA Vice City during "All Hands on Deck!" in GTA Vice City. While it is possible to reach the cars and enter them, it is impossible to drive them during the mission (as the mission immediately ends and the car is lost). It is possible to push one of them to where the mission would start as an alternative, jump in, leading to mission failure which warps the player back to the nearby mission trigger with the car hopefully waiting there. One of two black Washingtons featured during "All Hands on Deck!" in GTA Vice City. Comparison between the black Washington found during "All Hands on Deck!" and the dark gray FBI Washington. The requested Washington in Stevie's Car Thefts in GTA IV. A special wagon version of the Washington is used for the game's rendition of the Romero hearse. A Washington is also requested as part of Stevie's Car Thefts; unlike most vehicles in the side mission, the Washington appears with a black body color that is not unique, as many black Washington's can be seen around Algonquin. The name is mostly always meant to be a parody of a full-size luxury Lincoln sedan (Abraham Lincoln and George Washington having both been Presidents of the United States). On the GTA Vice City website, it is claimed that the car is an import from the United Kingdom, which would contradict its similarities to Lincoln vehicles. A cutscene-only Washington in the opening cutscene of "Outrider", GTA San Andreas, sporting a higher-than-usual greenhouse. In GTA San Andreas, an alternate, cutscene-only version of the Washington appears in the opening cutscene of "Outrider", with a heightened greenhouse. This is presumably done as the greenhouse on regular Washington's may have been too short for scenes within the car. The variant also features lower ground clearance and a steering wheel model that can be rotated. Like the Blista Compact and Mesa Grande, the Washington has different engine sounds in each third generation game. After collecting all thirty cars for Stevie in GTA IV, a Washington may be sold at his garage for $2,200. The GTA IV rendition of the Washington will make an audible "door ajar" dinging noise if the player exits the vehicle but leaves the door open. It can be heard clearly in quiet areas with the volume turned up. The Journey in GTA IV. Can be seen around the airport and Downtown. Normally can appear around Washington Beach and Ocean Beach. Seen occasionally around the North Point Mall in Vice Point. Spawns next to Mike Toreno's Ranch (save point) in Tierra Robada. Stealing this Washington triggers a one-star wanted level, owing to the fact that this Washington is a government vehicle. Spawns around Easter Basin and Doherty in San Fierro. Spawns in Market and Rodeo in Los Santos. Spawns around lower Tierra Robada. Spawns with the "beach theme" cheat code. Occasionally found in the parking lot of Vice Point Mall in Vice Point, Vice City. Found in the parking lot behind Lance Vance's hotel in Downtown, Vice City. Found at the car park on the left side of Hyman Memorial Stadium in Downtown. It is found regularly at the car park near the VIP terminal at Escobar International Airport. Usually in central Algonquin, and also in Alderney. It rarely spawns at Broker, Dukes, or Bohan. Parked on Franklin Avenue, Steinway, opposite Steinway Park, when requested in Stevie's Car Thefts. This page was last modified on 15 January 2015, at 02:04.